They're one of our favorite candle brands. We've known Ben and Blake of Village Common for years, long before they created their continually growing brand. Back in the fall we popped into their Catskill, New York shop to see the new space and to learn more about the brand and their journey into retail. What is the story behind Village Commons? Beginning in 1968, and from where we get our name, the first Village Common opened its doors in Avenel, New Jersey. It was run by Grandma Bernadette, current owner Ben Lebel’s grandmother. In its first incarnation, Village Common was an antique store of carefully selected, fine pieces from all eras. Grandma Bernadette also had beautiful plants and flowers for sale on the front porch that always attracted passers by to stop in. In 1984, the Village Common moved to Stroudsburg, Pa., on the property of the Stroudsmoor Country Inn, and was re-imagined into a country store by Susan Lebel, Bernadette’s daughter and Ben’s mother. Antiques were still available alongside candles, soaps, homemade canned goods, and unique gift ideas. Susan has since blossomed this once country store into a thriving floral and decor studio. From our southern roots, Billy Hays, current owner Blake Hays’ grandfather, opened his first country store in Pineville, Louisiana in 1960. It served as a vintage bodega; offering local produce and custom goods. Because of the construction of the new “American Highway”, Billy moved and opened his second store in 1978. This time offering mouth watering barbecue and other country store favorites. After years of serving his community, he decided to close the doors to his store. We bring to you a new installment of these family traditions blended together. Creating handmade, natural apothecary goods, kindled by their family history, we are continuing the legacy of the Village Common. Why did you want to become a maker? I believe it’s just who we are and born to be. We were always making something as individuals and as partners. We saw the yearning for quality goods and something besides the mundane or what was available at every corner store. We wanted to create that for people. We also found a beautiful community of makers in the Hudson Valley and Catskill region of New York and wanted to contribute our skills and heritage to the movement. What were each of you doing prior to Village Common? We were both working for Ralph Lauren in NYC. Ben was in store development and helping to create new spaces for Ralph Laurent stores. I was working for the website creating the content you would see and shop from. Our jobs were very exciting and challenging but we both knew that we were ready to create our own lifestyle brand. So, we set off and haven’t looked back. Tell us about the Catskill community: Catskill is growing so fast! The community is one that is layered, evolving, quirky and so warm. We have become a very tight group in a short period of time. It feels like we are at the beginning of a very cool thing. It feels like a blessing to be a part of it. Why did you decide on that town? We felt like Catskill had everything we were looking for. We could afford to produce, have a shop and live in the Village of Catskill. That was really important for us. We are also so close to Albany/Troy, Kingston, the Catskill mountains are 10 minutes down the road, and the train ride to NYC is 2 hours down the river. We felt like Catskill had been overlooked and we were puzzled as to why. So, we moved in and love calling it home. How has it been adapting to the Hudson Valley way of life? It has been quite a ride in the best way possible! We have had so much fun opening a store and getting to know the community in and around the Hudson Valley. Life is beautiful up here. The hiking, small towns, farms and events keep us busy and finding new ways to enjoy our life up here. We love the Hudson Valley! What made you want to open a store? We have been dreaming of opening a store since we started the Village Common over 3 years ago. So, it was always on the radar. We wanted to have a space where people could come and see us and where their candles are made. It works out really well that we have the candles made in house. We also wanted a place to display more of our lifestyle vision for Village Common. 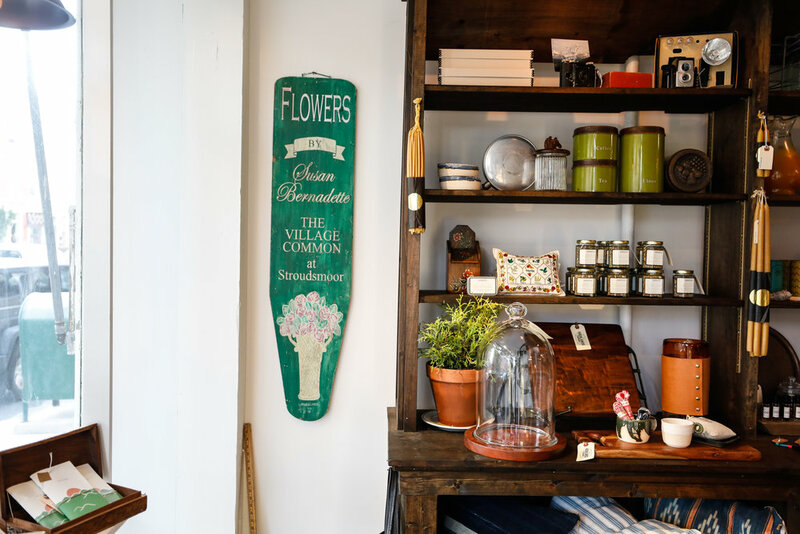 In our store you will find anything from handmade bags by local artisans or vintage barware to tool boxes and spices from our neighbor. We try to have something for everyone. This was a way for us to also reach deeper into our community and establish ourselves as a member of the Catskill growing maker/retail scene. What are your most popular products? Our most popular product is our American Landscape candles. It was the first thing we created and people continue to express their love for the scents. We only use essential oils to fragrance our products and I feel this is what people keep coming back for. What challenges have you faced being in a small town and how has the shop/business adapted to those? Our biggest challenge is getting people to our town and in our store. We adapted before we opened creating a space to fulfill orders in the back of house right in our shop. So, we create all of our product and have the store under one roof. This helps us with the slow traffic because we can still be working while we entertain our guests that do happen to visit us. What is the most rewarding aspect of being in a small town? Community for sure. There is nothing like a small community behind you and all of your fellow business owners cheering you on. What’s your favorite product in the store? Besides our Village Common product, we carry vintage African indigo textiles and that is one of our favorite things to share with our clients and thrown on ourselves. Walk us through the design/aesthetic process a bit: This is an ever evolving and constantly shifting process. We are always putting together drawings, colors, designs, ideas and building things. It’s also a lot of trial and error. We have a clear vision, but actually creating what we see is the tricky part. I think the process is just that, a process. It’s just Ben and I so we get to figure it all out. Sometimes this is challenging but it is always rewarding to put into motion what we are dreaming. What’s next? We are planning to grow our personal line into more products and we are also planning to expand our store and hopefully dive deeper into the lifestyle portion of our Village Common dream. Why Must We Protect Our Public Lands?